A morph between two straight-line planar drawings of the same graph is a continuous transformation from the first to the second drawing such that planarity is preserved at all times. Each step of the morph moves each vertex at constant speed along a straight line. Although the existence of a morph between any two drawings was established several decades ago, only recently it has been proved that a polynomial number of steps suffices to morph any two planar straight-line drawings. Namely, at SODA 2013, Alamdari et al. proved that any two planar straight-line drawings of a planar graph can be morphed in O(n 4) steps, while O(n 2) steps suffice if we restrict to maximal planar graphs. In this paper, we improve upon such results, by showing an algorithm to morph any two planar straight-line drawings of a planar graph in O(n 2) steps; further, we show that a morph with O(n) steps exists between any two planar straight-line drawings of a series-parallel graph. 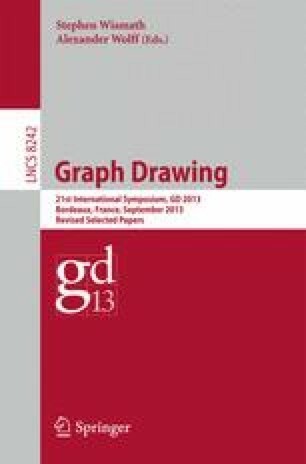 Part of the research was conducted in the framework of ESF project 10-EuroGIGA-OP-003 GraDR “Graph Drawings and Representations”.